Step 1 - Choose your PARTY PACKAGE. Our Standard Party includes an interactive show with an exciting line-up of awesome chemical reactions, dynamic illusions, fun kitchen chemistry, and special effects, followed by a cool Take-Home Experiment. Crank up the fun with upgrades, loot bags, extras and more! ** Includes an assistant when available. Superballs are not an eligible option for parties with 24+ children. Step 2 - Choose an exciting TAKE-HOME EXPERIMENT which is included in each party package. Each take-home experiment provides a hands-on experience for your guests and comes in a cool Mad Science cup with a lid for easy transport home after the party. Slime - Ooey, gooey, there's nothing else on earth like it - it's SLIME. If you choose slime, we'll present you with an amazing chemical reaction resulting in this wondrous goop. Yes, it may be icky looking but our special chemicals are mess-free, child-safe and hassle-free. Silly Putty - You can tug it, mash it, roll it, and streeeeetch it. As with Slime, an intriguing discussion on the chemical reactions occurring during its production will take place. All the equipment will be provided and the children will be able to take it home. Don't worry, like all our experiments, this one is mess-free and safe. Step 3 - Choose your awesome UPGRADES, according to your chosen package. 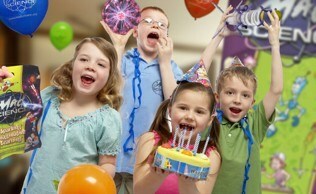 Each upgrade adds a little bit of time and a lot of pizzazz to your party! Dry Ice…So Coooool! Have you ever seen a coin dance? Scissors sizzle? Well you will at this party where kids will participate in the BIG BURP, BUBBLING BUBBLES, MAD SCIENCE SHOWER, and SPECIAL F/X. The frigidly fun activities help children to understand a series of hot topics such as the three states of matter, the temperatures of dry ice (-79c), and sublimation. It doesn't get any cooler than this! Cotton Candy…Sweet! Believe it - there is chemistry behind cotton candy: namely, how heat is transferred causing sugar to change from a solid to a liquid state and back again. We will explain these phenomena and of course make sure that there is enough of the yummy stuff to go around. Note: This activity may set off smoke alarms and is recommended for a well ventilated area or an outdoor space. Step 4 - Complete your party with fantastic EXTRAS - LOOT BAGS, LAB COATS, T-SHIRTS, GIFTS, & INVITATIONS. Loot Bags - An incredible value at just $5! Each high quality bag is filled with seven Mad Science activities which will keep kids entertained long after the party is over. What a great way to end off an amazing day! Click here to see all the items included in each bag! Child-Sized Lab Coats - Fuel your child's passion for science with their very own lab coat for just $7 or amaze your party guests with a lab coat for each of them. Just $6 each for ten or more. T-Shirts - A cool way to let your friends know that you LOVE Mad Science! A great deal at just $10 each. One FREE t-shirt is included in the Megawatt and Gigawatt packages. Children’s sizes small, medium, and large are available, as well as adult sizes. Gift - A little something extra for the birthday child! Choose from a Shuttle Copter, Foam Flyer, or Drag Racer, only $5 each! Your choice of FREE gift is included with the Megawatt and Gigawatt packages. 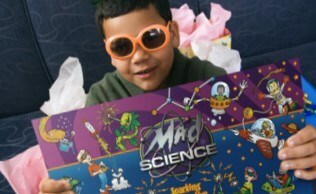 Invitations - Start the hype early with Mad Science party invitations! Print your own at home using our free designs. Step 5 - Book your party! NOTE: Party dates and times are subject to availability. Your party has not been confirmed until Mad Science provides you with a confirmation. Contact our team by phone at 416-630-5282 or email birthdays@madscience.on.ca. We have FUN down to a SCIENCE!